The Baytown Area Amateur Radio club provides communications annually for Baytown YMCA's Gator Ride. This is accomplished via club hosted net control and stationing club members/hams in Sag Wagons and Rest Stops along the routes. 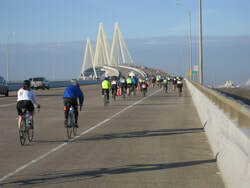 The ride is an official BP MS150 training ride and covers a lot of ground in Baytown and it's surrounding communities. Set-up: Those working the event in Sag wagons need to meet at the communication trailer (Lee College parking lot) at 6AM. Those working rest stops along the route need to be at their designated rest stop by 7AM and should check in with Net control once set up and operational. Contact: Event Coordinator Ken Hall (AE5EO) at kbh1977@verizon.net for more information or to volunteer. BAARC's February 27th net is THE LAST Tuesday night net prior to Gator Ride. If you are working the event, please plan to check in. Final details will be discussed.